IIHS Top Safety Pick. Only 37,333 Miles! Scores 33 Highway MPG and 25 City MPG! Dealer Certified Pre-Owned. This Buick Encore delivers a Turbocharged I4 1.4/83 engine powering this Automatic transmission. TRANSMISSION, 6-SPEED AUTOMATIC, ELECTRONICALLY CONTROLLED WITH OVERDRIVE includes Driver Shift Control (STD), SEATS, FRONT BUCKET (STD), ENGINE, ECOTEC TURBO 1.4L VARIABLE VALVE TIMING DOHC 4-CYLINDER SEQUENTIAL MFI (138 hp [102.9 kW] @ 4900 rpm, 148 lb-ft of torque [199.8 N-m] @ 1850 rpm) (STD). *This Buick Encore Comes Equipped with These Options *EBONY, UPSCALE CLOTH SEAT TRIM WITH LEATHERETTE ACCENTS, DARK COCOA ASH LOWER ACCENT COLOR, COCOA SILVER METALLIC (Built out for 2015 model year. Includes (BQU) Dark Cocoa Ash lower accent color. ), AUDIO SYSTEM, AM/FM/SIRIUSXM STEREO WITH MP3 CD PLAYER IntelliLink with 7 diagonal color LCD display, USB port, Radio Data System (RDS) and auxiliary input jack (STD), 1SB PREFERRED EQUIPMENT GROUP Includes Standard Equipment, Wipers, front intermittent with pulse washers, Wiper, rear intermittent, Windshield, solar absorbing, Windows, power, rear with Express-Down, Window, power with front passenger Express-Down. *This Buick Encore is a Superstar! *IIHS Top Safety Pick, KBB.com 5-Year Cost to Own Awards, KBB.com Brand Image Awards. *See What the Experts Say! *As reported by KBB.com: Small doesn't have to mean skimpy. The 2015 Buick Encore SUV may be compact, but its bold appearance, long list of luxury and electronic trappings and modern drivetrain make it an exceptionally good value. 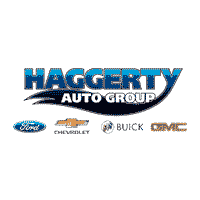 *Stop By Today *A short visit to Haggerty Pontiac GMC located at 300 W. Roosevelt Rd., Villa Park, IL 60181 can get you a dependable Encore today!JUST ANNOUNCED!!! !Free Oil Change and Tire Rotation for 24 Months or 24,000 miles with the GM Certified Warranty! 12 MONTH/12000-Miles Bumper-To-Bumper Warranty! 5YRS 100000 Miles Powertrain Warranty,172-Point Inspection with Two Year Maintenance Plan Roadside Assistance and Courtesy Transportation! (The 12 month/12,000 miles warranty will go into effect after the new vehicle warranty has expired.) Let's Do the Math. New Warranty: 36-months/36,000-miles Certified Warranty: 12-months/12,000-mles Total Warranty: 48-months/48,000-miles THAT MEANS SIMPLY THAT GM CERTIFIED USED HAVE 1 YEAR LONGER THAN NEW!JUST ANNOUNCED!!! !Free Oil Change and Tire Rotation for 24 Months or 24,000 miles with the GM Certified Warranty! 12 MONTH/12000-Miles Bumper-To-Bumper Warranty! 5YRS 100000 Miles Powertrain Warranty,172-Point Inspection with Two Year Maintenance Plan Roadside Assistance and Courtesy Transportation! (The 12 month/12,000 miles warranty will go into effect after the new vehicle warranty has expired.) Let's Do the Math. New Warranty: 36-months/36,000-miles Certified Warranty: 12-months/12,000-mles Total Warranty: 48-months/48,000-miles THAT MEANS SIMPLY THAT GM CERTIFIED USED HAVE 1 YEAR LONGER THAN NEW!You might not expect a 5-Passenger Cossover to be crafted as finely as a Swiss Watch. We now introduce you to our New Buick Encore. The Luxury Crossover with Premium Materials, Ingenious Design, Flexible Storage, and Purposeful Technology. It is Sculpted, Elegant, Nimble, Efficient, and Luxurious, all at the Same Time. This Vehicle Will Turn Heads. The Technological Innovations provide everything from peace and quiet to piece of mind. Your Entertainment and Navigation choices are Simple, Purposeful and Empowering- the way Personal Luxury should be. Available Features include Remote Start, Rainsense Wipers, Rearview Camera, Memory Seats, Front and Rear Park Assist, Navigation, and much more. Encore takes Safety to a whole new Standard with 10 Air Bags, and available features such as Forward Collision Alert, Lane Departure Warning, and All Wheel Drive. Come and take a Test Drive and see for yourself what the New Standard In Luxury has Become.You might not expect a 5-Passenger Cossover to be crafted as finely as a Swiss Watch. We now introduce you to our New Buick Encore. The Luxury Crossover with Premium Materials, Ingenious Design, Flexible Storage, and Purposeful Technology. It is Sculpted, Elegant, Nimble, Efficient, and Luxurious, all at the Same Time. This Vehicle Will Turn Heads. The Technological Innovations provide everything from peace and quiet to piece of mind. Your Entertainment and Navigation choices are Simple, Purposeful and Empowering- the way Personal Luxury should be. Available Features include Remote Start, Rainsense Wipers, Rearview Camera, Memory Seats, Front and Rear Park Assist, Navigation, and much more. Encore takes Safety to a whole new Standard with 10 Air Bags, and available features such as Forward Collision Alert, Lane Departure Warning, and All Wheel Drive. Come and take a Test Drive and see for yourself what the New Standard In Luxury has Become.JUST ANNOUNCED!!! !Free Oil Change and Tire Rotation for 24 Months or 24,000 miles with the GM Certified Warranty! 12 MONTH/12000-Miles Bumper-To-Bumper Warranty! 5YRS 100000 Miles Powertrain Warranty,172-Point Inspection with Two Year Maintenance Plan Roadside Assistance and Courtesy Transportation! (The 12 month/12,000 miles warranty will go into effect after the new vehicle warranty has expired.) Let's Do the Math. New Warranty: 48-months/50,000-miles Certified Warranty: 12-months/12,000-mles Total Warranty: 60-months/62,000-miles THAT MEANS SIMPLY THAT GM CERTIFIED USED HAVE 1 YEAR LONGER THAN NEW! Scores 38 Highway MPG and 29 City MPG! Dealer Certified Pre-Owned. This Chevrolet Cruze boasts a Turbocharged Gas I4 1.4L/ engine powering this Automatic transmission. WHEELS, 16 (40.6 CM) ALUMINUM (STD), TRANSMISSION, 6-SPEED AUTOMATIC (STD), TIRES, 205/55R16 ALL-SEASON, BLACKWALL (STD). *This Chevrolet Cruze Features the Following Options *CONVENIENCE PACKAGE includes (ATH) Keyless Open, (BTM) Keyless Start, (KA1) heated driver and front passenger seats and (AH5) driver 8-way power seat adjuster, and (BTV) remote vehicle starter system [with automatic transmission only]; deletes (KTF) primary foldable key , SILVER ICE METALLIC, SEATS, HEATED DRIVER AND FRONT PASSENGER, SEATS, FRONT BUCKET WITH RECLINING SEATBACKS AND ADJUSTABLE HEAD RESTRAINTS (STD), SEAT ADJUSTER, DRIVER 8-WAY POWER, REMOTE VEHICLE STARTER SYSTEM, LT PREFERRED EQUIPMENT GROUP includes Standard Equipment, LICENSE PLATE BRACKET, FRONT, KEYLESS START, KEYLESS OPEN. *Know You're Making a Reliable Purchase *Haggerty Pontiac GMC graded the Overall Condition of this vehicle as Excellent. This vehicle has never been smoked in! *Visit Us Today *Treat yourself- stop by Haggerty Pontiac GMC located at 300 W. Roosevelt Rd., Villa Park, IL 60181 to make this car yours today!JUST ANNOUNCED!!! !Free Oil Change and Tire Rotation for 24 Months or 24,000 miles with the GM Certified Warranty! 12 MONTH/12000-Miles Bumper-To-Bumper Warranty! 5YRS 100000 Miles Powertrain Warranty,172-Point Inspection with Two Year Maintenance Plan Roadside Assistance and Courtesy Transportation! (The 12 month/12,000 miles warranty will go into effect after the new vehicle warranty has expired.) Let's Do the Math. New Warranty: 36-months/36,000-miles Certified Warranty: 12-months/12,000-mles Total Warranty: 48-months/48,000-miles THAT MEANS SIMPLY THAT GM CERTIFIED USED HAVE 1 YEAR LONGER THAN NEW!JUST ANNOUNCED!!! !Free Oil Change and Tire Rotation for 24 Months or 24,000 miles with the GM Certified Warranty! 12 MONTH/12000-Miles Bumper-To-Bumper Warranty! 5YRS 100000 Miles Powertrain Warranty,172-Point Inspection with Two Year Maintenance Plan Roadside Assistance and Courtesy Transportation! (The 12 month/12,000 miles warranty will go into effect after the new vehicle warranty has expired.) Let's Do the Math. New Warranty: 36-months/36,000-miles Certified Warranty: 12-months/12,000-mles Total Warranty: 48-months/48,000-miles THAT MEANS SIMPLY THAT GM CERTIFIED USED HAVE 1 YEAR LONGER THAN NEW!JUST ANNOUNCED!!! !Free Oil Change and Tire Rotation for 24 Months or 24,000 miles with the GM Certified Warranty! 12 MONTH/12000-Miles Bumper-To-Bumper Warranty! 5YRS 100000 Miles Powertrain Warranty,172-Point Inspection with Two Year Maintenance Plan Roadside Assistance and Courtesy Transportation! (The 12 month/12,000 miles warranty will go into effect after the new vehicle warranty has expired.) Let's Do the Math. New Warranty: 36-months/36,000-miles Certified Warranty: 12-months/12,000-mles Total Warranty: 48-months/48,000-miles THAT MEANS SIMPLY THAT GM CERTIFIED USED HAVE 1 YEAR LONGER THAN NEW! IIHS Top Safety Pick. Only 29,122 Miles! Boasts 33 Highway MPG and 25 City MPG! Carfax One-Owner Vehicle. Dealer Certified Pre-Owned. This Buick Encore boasts a Turbocharged I4 1.4/83 engine powering this Automatic transmission. TRANSMISSION, 6-SPEED AUTOMATIC, ELECTRONICALLY CONTROLLED WITH OVERDRIVE includes Driver Shift Control (STD), TITANIUM, UPSCALE CLOTH SEAT TRIM WITH LEATHERETTE ACCENTS, SEATS, FRONT BUCKET (STD). *This Buick Encore Comes Equipped with These Options *ENGINE, ECOTEC TURBO 1.4L VARIABLE VALVE TIMING DOHC 4-CYLINDER SEQUENTIAL MFI (138 hp [102.9 kW] @ 4900 rpm, 148 lb-ft of torque [199.8 N-m] @ 1850 rpm) (STD), DARK ARGENT METALLIC LOWER ACCENT COLOR, CARBON BLACK METALLIC (Additional charge - premium paint. Includes (BT3) Dark Argent Metallic lower accent color. ), AUDIO SYSTEM, AM/FM/SIRIUSXM STEREO WITH MP3 CD PLAYER IntelliLink with 7 diagonal color LCD display, USB port, Radio Data System (RDS) and auxiliary input jack (STD), 1SB PREFERRED EQUIPMENT GROUP Includes Standard Equipment, Wipers, front intermittent with pulse washers, Wiper, rear intermittent, Windshield, solar absorbing, Windows, power, rear with Express-Down, Window, power with front passenger Express-Down. *Feel Confident About Your Choice *According to Carfax's history report: Carfax One-Owner Vehicle. Haggerty Pontiac GMC graded the Overall Condition of this vehicle as Excellent. This vehicle has never been smoked in! *This Buick Encore is a Superstar! *IIHS Top Safety Pick, KBB.com 5-Year Cost to Own Awards, KBB.com Brand Image Awards. *The Experts' Verdict...*As reported by KBB.com: Small doesn't have to mean skimpy. The 2015 Buick Encore SUV may be compact, but its bold appearance, long list of luxury and electronic trappings and modern drivetrain make it an exceptionally good value. *Stop By Today *Come in for a quick visit at Haggerty Pontiac GMC, 300 W. Roosevelt Rd., Villa Park, IL 60181 to claim your Buick Encore!JUST ANNOUNCED!!! !Free Oil Change and Tire Rotation for 24 Months or 24,000 miles with the GM Certified Warranty! 12 MONTH/12000-Miles Bumper-To-Bumper Warranty! 5YRS 100000 Miles Powertrain Warranty,172-Point Inspection with Two Year Maintenance Plan Roadside Assistance and Courtesy Transportation! (The 12 month/12,000 miles warranty will go into effect after the new vehicle warranty has expired.) Let's Do the Math. New Warranty: 48-months/50,000-miles Certified Warranty: 12-months/12,000-mles Total Warranty: 60-months/62,000-miles THAT MEANS SIMPLY THAT GM CERTIFIED USED HAVE 1 YEAR LONGER THAN NEW! IIHS Top Safety Pick. Only 30,685 Miles! Boasts 33 Highway MPG and 25 City MPG! This Buick Encore boasts a Turbocharged I4 1.4/83 engine powering this Automatic transmission. TRANSMISSION, 6-SPEED AUTOMATIC, ELECTRONICALLY-CONTROLLED WITH OVERDRIVE includes Driver Shift Control (STD), SEATS, FRONT BUCKET (STD), LPO, CARGO MAT, COLOR-KEYED CARPETED. *This Buick Encore Features the Following Options *LPO, BUICK INTERIOR PROTECTION PACKAGE includes the following dealer installed LPO accessories: (VAV) First and second row all-weather floor mats and (VLI) Color-keyed carpeted cargo mat , LPO, ALL-WEATHER FLOOR MATS, FRONT AND REAR, COLOR-KEYED, LICENSE PLATE BRACKET, FRONT, GRAPHITE GRAY METALLIC Includes (BT3) Dark Argent Metallic lower accent color. ), ENGINE, ECOTEC TURBO 1.4L VARIABLE VALVE TIMING DOHC 4-CYLINDER SEQUENTIAL MFI (138 hp [102.9 kW] @ 4900 rpm, 148 lb-ft of torque [199.8 N-m] @ 1850 rpm) (STD), EBONY, UPSCALE CLOTH SEAT TRIM WITH LEATHERETTE ACCENTS, DARK ARGENT METALLIC LOWER ACCENT COLOR, AUDIO SYSTEM, AM/FM/SIRIUSXM STEREO WITH MP3 CD PLAYER IntelliLink with 7 diagonal color LCD display, USB port, Radio Data System (RDS) and auxiliary input jack (STD), 1SB PREFERRED EQUIPMENT GROUP Includes Standard Equipment, Wipers, front intermittent with pulse washers. *Know You're Making a Reliable Purchase *Haggerty Pontiac GMC graded the Overall Condition of this vehicle as Excellent. Non-smoker vehicle! *The Votes are Counted *IIHS Top Safety Pick, IIHS Top Safety Pick with optional front crash prevention, KBB.com 5-Year Cost to Own Awards, KBB.com Brand Image Awards. *See What the Experts Say! *As reported by Edmunds: Quiet interior; top crash scores; good fuel economy; long list of tech and safety features. *Visit Us Today *Test drive this must-see, must-drive, must-own beauty today at Haggerty Pontiac GMC, 300 W. Roosevelt Rd., Villa Park, IL 60181.JUST ANNOUNCED!!! !Free Oil Change and Tire Rotation for 24 Months or 24,000 miles with the GM Certified Warranty! 12 MONTH/12000-Miles Bumper-To-Bumper Warranty! 5YRS 100000 Miles Powertrain Warranty,172-Point Inspection with Two Year Maintenance Plan Roadside Assistance and Courtesy Transportation! (The 12 month/12,000 miles warranty will go into effect after the new vehicle warranty has expired.) Let's Do the Math. New Warranty: 48-months/50,000-miles Certified Warranty: 12-months/12,000-mles Total Warranty: 60-months/62,000-miles THAT MEANS SIMPLY THAT GM CERTIFIED USED HAVE 1 YEAR LONGER THAN NEW!You might not expect a 5-Passenger Cossover to be crafted as finely as a Swiss Watch. We now introduce you to our New Buick Encore. The Luxury Crossover with Premium Materials, Ingenious Design, Flexible Storage, and Purposeful Technology. It is Sculpted, Elegant, Nimble, Efficient, and Luxurious, all at the Same Time. This Vehicle Will Turn Heads. The Technological Innovations provide everything from peace and quiet to piece of mind. Your Entertainment and Navigation choices are Simple, Purposeful and Empowering- the way Personal Luxury should be. Available Features include Remote Start, Rainsense Wipers, Rearview Camera, Memory Seats, Front and Rear Park Assist, Navigation, and much more. Encore takes Safety to a whole new Standard with 10 Air Bags, and available features such as Forward Collision Alert, Lane Departure Warning, and All Wheel Drive. Come and take a Test Drive and see for yourself what the New Standard In Luxury has Become. THIS 2017 CHEVROLET CRUZE PREMIER IS EQUIPPED WITH FULL FACTORY POWER EQUIPMENT !! BACKUP CAMERA / REMOTE START !! ALLOY WHEELS !! 1 OWNER ACCIDENT FREE CARFAX ! !GM Certified Pre-Owned means you not only get the reassurance of a 12mo/12,000-Mile Bumper-to-Bumper limited warranty, but also a 1yr/12,000-Mile Standard CPO Maintenance Plan, up to a 6-Year/100,000-Mile, $0 Deductible, Fully Transferable, Powertrain Limited Warranty, a 172-point inspection/reconditioning, 24/7 roadside assistance, Courtesy Transportation, 3-Day/150-Mile Customer Satisfaction Guarantee, 3 month trial OnStar Directions & Connections Service if available, SiriusXM Radio 3mo trial if available, and a Carfax vehicle history report. Again, we offer rock bottom prices and a hassle free shopping experience.Feel free to contact Chris Lewin, our Used Vehicle Manager, if you have any questions. His email is clewin@haggertyautogroup.com or call Chris at (888)277-3151. For Value and Integrity....It Has to be HAGGERTY !!! OUR PRICING PHILOSOPHY: We offer rock bottom prices in a hassle free shopping environment. * We shop EVERY vehicle we take in out OVER 100 square miles against vehicles with comparable equipment and miles to ensure you the most value for your hard earned money. Every vehicle goes through a 120 point inspection to ensure you are purchasing a safe vehicle and we can't put the warranty on without making it right! We will even show you our report as well as what we did to the vehicle to make it right for you! How many other dealers will show you that?! We enroll you in our owner rewards program which gives you a free oil change plus a flexible spending account for your vehicles! We put money into your account every time you service with us! 5% of your service bill gets put into this account for your use on ANY car in your household! * *WHY SHOULD YOU HURRY**:* We aggressively price and market all our vehicles on 20 different websites to sell FAST and we sell 90% of our inventory EVERY month. We do NOT hold cars so if something interests you that we have, then the sooner you can make it in the better chance you have of getting it! Feel free to contact our friendly sales staff at (888)301-8863 or email our used car manager, Chris Lewin at clewin@haggertyautogroup.com For Value and Integrity....It Has to be HAGGERTY !!! JD Power Initial Quality Study (IQS). Only 30,470 Miles! Boasts 32 Highway MPG and 22 City MPG! Carfax One-Owner Vehicle. Dealer Certified Pre-Owned. This GMC Terrain boasts a Gas/Ethanol I4 2.4L/145 engine powering this Automatic transmission. TRANSMISSION, 6-SPEED AUTOMATIC (STD), SLE-1 PREFERRED EQUIPMENT GROUP Includes Standard Equipment, SEATS, FRONT BUCKET (STD). *This GMC Terrain Features the Following Options *LPO, CARGO AREA CLOSE-OUT PANEL, LICENSE PLATE BRACKET, FRONT, JET BLACK, PREMIUM CLOTH, IRIDIUM METALLIC, ENGINE, 2.4L DOHC 4-CYLINDER SIDI (SPARK IGNITION DIRECT INJECTION) with VVT (Variable Valve Timing) (182 hp [135.7 kW] @ 6700 rpm, 172 lb-ft [232.2 N-m] @ 4900 rpm) (STD), AXLE, 3.23 FINAL DRIVE RATIO, AUDIO SYSTEM, COLOR TOUCH AM/FM/SIRIUSXM STEREO WITH MP3 PLAYBACK includes 7 diagonal color touch-screen display, USB port, AUX port and iPod support (STD) (Includes Bluetooth for phone. ), Wipers, front intermittent with washers, Wiper, rear intermittent with washer, Windows, power with driver and front passenger Express-Down. *This GMC Terrain is a Superstar! *JD Power Initial Quality Study (IQS), IIHS Top Safety Pick, IIHS Top Safety Pick with optional front crash prevention, KBB.com Brand Image Awards. *The Experts' Verdict...*As reported by Edmunds: Powerful available V6 engine; quiet interior; comfortable highway ride; spacious and adjustable backseat. *Stop By Today *Test drive this must-see, must-drive, must-own beauty today at Haggerty Pontiac GMC, 300 W. Roosevelt Rd., Villa Park, IL 60181. KBB.com 5-Year Cost to Own Awards. Only 22,479 Miles! Delivers 33 Highway MPG and 25 City MPG! Dealer Certified Pre-Owned. This Buick Encore delivers a Turbocharged I4 1.4/83 engine powering this Automatic transmission. TRANSMISSION, 6-SPEED AUTOMATIC, ELECTRONICALLY-CONTROLLED WITH OVERDRIVE includes Driver Shift Control (STD), SPORT TOURING PREFERRED EQUIPMENT GROUP Includes Standard Equipment, SIDE BLIND ZONE ALERT. *This Buick Encore Comes Equipped with These Options *SAFETY PACKAGE includes (UFT) Side Blind Zone Alert and (UFG) Rear Cross-Traffic Alert , SEATS, FRONT BUCKET (STD), REAR CROSS-TRAFFIC ALERT, MOONROOF, POWER, TILT-SLIDING, MIRROR, INSIDE REARVIEW AUTO-DIMMING, LICENSE PLATE BRACKET, FRONT, ENGINE, ECOTEC TURBO 1.4L VARIABLE VALVE TIMING DOHC 4-CYLINDER SEQUENTIAL MFI (138 hp [102.9 kW] @ 4900 rpm, 148 lb-ft of torque [199.8 N-m] @ 1850 rpm) (STD), EBONY, CLOTH WITH LEATHERETTE SEAT TRIM, EBONY TWILIGHT METALLIC Includes (CM5) Black Carbon Metallic lower exterior accent color, Paint code W700S. ), BLACK CARBON METALLIC LOWER EXTERIOR ACCENT COLOR. *Know You're Making a Reliable Purchase *Haggerty Pontiac GMC graded the Overall Condition of this vehicle as Excellent. This vehicle has never been smoked in! *This Buick Encore is a Superstar! *KBB.com 5-Year Cost to Own Awards, KBB.com Brand Image Awards. *The Experts' Verdict...*As reported by Edmunds: Quiet interior on the highway; excellent crash-test scores; small engines deliver solid fuel economy; long list of tech and safety features. *Visit Us Today *Test drive this must-see, must-drive, must-own beauty today at Haggerty Pontiac GMC, 300 W. Roosevelt Rd., Villa Park, IL 60181.JUST ANNOUNCED!!! !Free Oil Change and Tire Rotation for 24 Months or 24,000 miles with the GM Certified Warranty! 12 MONTH/12000-Miles Bumper-To-Bumper Warranty! 5YRS 100000 Miles Powertrain Warranty,172-Point Inspection with Two Year Maintenance Plan Roadside Assistance and Courtesy Transportation! (The 12 month/12,000 miles warranty will go into effect after the new vehicle warranty has expired.) Let's Do the Math. New Warranty: 36-months/36,000-miles Certified Warranty: 12-months/12,000-mles Total Warranty: 48-months/48,000-miles THAT MEANS SIMPLY THAT GM CERTIFIED USED HAVE 1 YEAR LONGER THAN NEW!The perfectly sized Buick Encore is new for the model year, with refined styling, a modernized interior and progressive technologies that will help solidify its position as a premium entry in the rapidly growing Small SUV segment.You might not expect a 5-Passenger Cossover to be crafted as finely as a Swiss Watch. We now introduce you to our New Buick Encore. The Luxury Crossover with Premium Materials, Ingenious Design, Flexible Storage, and Purposeful Technology. It is Sculpted, Elegant, Nimble, Efficient, and Luxurious, all at the Same Time. This Vehicle Will Turn Heads. The Technological Innovations provide everything from peace and quiet to piece of mind. Your Entertainment and Navigation choices are Simple, Purposeful and Empowering- the way Personal Luxury should be.A new look gives Encore a confident, balanced appearance. Encore has sculpted fascia and new grille design, including Buick's tri-color insignia, with an enhanced and refined front and rear appearance. Premium, high-tech lighting with reshaped lamps adds sophistication and confidence on the road. A new flowing, cockpit-style interior provides a light, open atmosphere that is modern and precise. A new infotainment interface with a frameless 8-inch diagonal color touch-screen display and Buick IntelliLink is beautifully integrated and within easy reach.The Buick Encore embraces technology and allows drivers to stay connected with their digital lifestyle and to be more aware of their surroundings. This vehicle accentuates what Personal Luxury should be. Newest features include Keyless Open and Start, an 8-inch color touch-screen that includes support for Apple CarPlay and Android Auto compatibility for additional smartphone connectivity, Siri Eyes Free, Text Message Alerts, and available embedded Navigation. Available Features include a Confidence package that gives you Rear Cross Traffic Alert, Remote Start, and Side Blind Zone Alert to help drivers monitor the vehicle surroundings. Available Premium Package adds Forward Collision Alert, Front and Rear Parking Assist, Lane Departure Warning and Rainsense wipers to give drivers additional confidence on the road. All packages are available in All Wheel Drive if preferred for added safety and security.Come and take a Test Drive and see for yourself what the New Standard In Luxury has Become. THIS 2017 CHEVROLET CRUZE PREMIER IS EQUIPPED WITH FULL FACTORY POWER EQUIPMENT !! FACTORY MOONROOF !! HEATED LEATHER SEATS !! FACTORY NAVIGATION !! 18 INCH ALLOY WHEELS !! 1 OWNER ACCIDENT FREE CARFAX ! !GM Certified Pre-Owned means you not only get the reassurance of a 12mo/12,000-Mile Bumper-to-Bumper limited warranty, but also a 1YR/12,000-Mile Standard CPO Maintenance Plan, up to a 6-Year/100,000-Mile, $0 Deductible, Fully Transferable, Powertrain Limited Warranty, a 172-point inspection/reconditioning, 24/7 roadside assistance, Courtesy Transportation, 3-Day/150-Mile Customer Satisfaction Guarantee, 3 month trial OnStar Directions & Connections Service if available, SiriusXM Radio 3mo trial if available, and a Carfax vehicle history report. Again, we offer rock bottom prices and a hassle free shopping experience.Feel free to contact Chris Lewin, our Used Vehicle Manager, if you have any questions. His email is clewin@haggertyautogroup.com or call Chris at (888)277-3151. For Value and Integrity....It Has to be HAGGERTY !!! OUR PRICING PHILOSOPHY: We offer rock bottom prices in a hassle free shopping environment. * We shop EVERY vehicle we take in out OVER 100 square miles against vehicles with comparable equipment and miles to ensure you the most value for your hard earned money. Every vehicle goes through a 120 point inspection to ensure you are purchasing a safe vehicle and we can't put the warranty on without making it right! We will even show you our report as well as what we did to the vehicle to make it right for you! How many other dealers will show you that?! We enroll you in our owner rewards program which gives you a free oil change plus a flexible spending account for your vehicles! We put money into your account every time you service with us! 5% of your service bill gets put into this account for your use on ANY car in your household! * *WHY SHOULD YOU HURRY**:* We aggressively price and market all our vehicles on 20 different websites to sell FAST and we sell 90% of our inventory EVERY month. We do NOT hold cars so if something interests you that we have, then the sooner you can make it in the better chance you have of getting it! Feel free to contact our friendly sales staff at (888)301-8863 or email our used car manager, Chris Lewin at clewin@haggertyautogroup.com For Value and Integrity....It Has to be HAGGERTY !!! THIS 2017 CHEVROLET EQUINOX LT IS EQUIPPED WITH FULL FACTORY POWER EQUIPMENT !! BACKUP CAMERA / REMOTE START !! CONVINCE PACKAGE !! 1 OWNER ACCIDENT FREE CARFAX ! !GM Certified Pre-Owned means you not only get the reassurance of a 12mo/12,000-Mile Bumper-to-Bumper limited warranty, but also a 1yr/12000-Mile Standard CPO Maintenance Plan, up to a 6-Year/100,000-Mile, $0 Deductible, Fully Transferable, Powertrain Limited Warranty, a 172-point inspection/reconditioning, 24/7 roadside assistance, Courtesy Transportation, 3-Day/150-Mile Customer Satisfaction Guarantee, 3 month trial OnStar Directions & Connections Service if available, SiriusXM Radio 3mo trial if available, and a Carfax vehicle history report. Again, we offer rock bottom prices and a hassle free shopping experience.Feel free to contact Chris Lewin, our Used Vehicle Manager, if you have any questions. His email is clewin@haggertyautogroup.com or call Chris at (888)277-3151. For Value and Integrity....It Has to be HAGGERTY !!! OUR PRICING PHILOSOPHY: We offer rock bottom prices in a hassle free shopping environment. * We shop EVERY vehicle we take in out OVER 100 square miles against vehicles with comparable equipment and miles to ensure you the most value for your hard earned money. Every vehicle goes through a 120 point inspection to ensure you are purchasing a safe vehicle and we can't put the warranty on without making it right! We will even show you our report as well as what we did to the vehicle to make it right for you! How many other dealers will show you that?! We enroll you in our owner rewards program which gives you a free oil change plus a flexible spending account for your vehicles! We put money into your account every time you service with us! 5% of your service bill gets put into this account for your use on ANY car in your household! * *WHY SHOULD YOU HURRY**:* We aggressively price and market all our vehicles on 20 different websites to sell FAST and we sell 90% of our inventory EVERY month. We do NOT hold cars so if something interests you that we have, then the sooner you can make it in the better chance you have of getting it! Feel free to contact our friendly sales staff at (888)301-8863 or email our used car manager, Chris Lewin at clewin@haggertyautogroup.com For Value and Integrity....It Has to be HAGGERTY !!! THIS 2016 CHEVROLET MALIBU PREMIER IS EQUIPPED WITH FULL FACTORY POWER EQUIPMENT !! FACTORY PANOROOF !! NAVIGATION/ BACKUP CAMERA !! 19 INCH FACTORY WHEELS !! ADAPTIVE CRUISE CONTROL !! 1 OWNER ACCIDENT FREE CARFAX ! !GM Certified Pre-Owned means you not only get the reassurance of a 12mo/12,000-Mile Bumper-to-Bumper limited warranty, but also a 1YR/12000-Mile Standard CPO Maintenance Plan, up to a 6-Year/100,000-Mile, $0 Deductible, Fully Transferable, Powertrain Limited Warranty, a 172-point inspection/reconditioning, 24/7 roadside assistance, Courtesy Transportation, 3-Day/150-Mile Customer Satisfaction Guarantee, 3 month trial OnStar Directions & Connections Service if available, SiriusXM Radio 3mo trial if available, and a Carfax vehicle history report. Again, we offer rock bottom prices and a hassle free shopping experience.Feel free to contact Chris Lewin, our Used Vehicle Manager, if you have any questions. His email is clewin@haggertyautogroup.com or call Chris at (888)277-3151. For Value and Integrity....It Has to be HAGGERTY !!! OUR PRICING PHILOSOPHY: We offer rock bottom prices in a hassle free shopping environment. * We shop EVERY vehicle we take in out OVER 100 square miles against vehicles with comparable equipment and miles to ensure you the most value for your hard earned money. Every vehicle goes through a 120 point inspection to ensure you are purchasing a safe vehicle and we can't put the warranty on without making it right! We will even show you our report as well as what we did to the vehicle to make it right for you! How many other dealers will show you that?! We enroll you in our owner rewards program which gives you a free oil change plus a flexible spending account for your vehicles! We put money into your account every time you service with us! 5% of your service bill gets put into this account for your use on ANY car in your household! * *WHY SHOULD YOU HURRY**:* We aggressively price and market all our vehicles on 20 different websites to sell FAST and we sell 90% of our inventory EVERY month. We do NOT hold cars so if something interests you that we have, then the sooner you can make it in the better chance you have of getting it! Feel free to contact our friendly sales staff at (888)301-8863 or email our used car manager, Chris Lewin at clewin@haggertyautogroup.com For Value and Integrity....It Has to be HAGGERTY !!! THSI 2017 CHEVROLET EQUINOX LT IS EQUIPPED WITH FULL FACTORY POWER EQUIPMENT !! HEATED FRONT SEATS !! BACKUP CAMERA !! CONVIENCE PACKAGE !! 1 OWNER ACCIDENT FREE CARFAX ! !GM Certified Pre-Owned means you not only get the reassurance of a 12mo/12,000-Mile Bumper-to-Bumper limited warranty, but also a 1yr/12000-Mile Standard CPO Maintenance Plan, up to a 6-Year/100,000-Mile, $0 Deductible, Fully Transferable, Powertrain Limited Warranty, a 172-point inspection/reconditioning, 24/7 roadside assistance, Courtesy Transportation, 3-Day/150-Mile Customer Satisfaction Guarantee, 3 month trial OnStar Directions & Connections Service if available, SiriusXM Radio 3mo trial if available, and a Carfax vehicle history report. Again, we offer rock bottom prices and a hassle free shopping experience.Feel free to contact Chris Lewin, our Used Vehicle Manager, if you have any questions. His email is clewin@haggertyautogroup.com or call Chris at (888)277-3151. For Value and Integrity....It Has to be HAGGERTY !!! OUR PRICING PHILOSOPHY: We offer rock bottom prices in a hassle free shopping environment. * We shop EVERY vehicle we take in out OVER 100 square miles against vehicles with comparable equipment and miles to ensure you the most value for your hard earned money. Every vehicle goes through a 120 point inspection to ensure you are purchasing a safe vehicle and we can't put the warranty on without making it right! We will even show you our report as well as what we did to the vehicle to make it right for you! How many other dealers will show you that?! We enroll you in our owner rewards program which gives you a free oil change plus a flexible spending account for your vehicles! We put money into your account every time you service with us! 5% of your service bill gets put into this account for your use on ANY car in your household! * *WHY SHOULD YOU HURRY**:* We aggressively price and market all our vehicles on 20 different websites to sell FAST and we sell 90% of our inventory EVERY month. We do NOT hold cars so if something interests you that we have, then the sooner you can make it in the better chance you have of getting it! Feel free to contact our friendly sales staff at (888)301-8863 or email our used car manager, Chris Lewin at clewin@haggertyautogroup.com For Value and Integrity....It Has to be HAGGERTY !!! JD Power Initial Quality Study. Only 10,583 Miles! Delivers 31 Highway MPG and 21 City MPG! Carfax One-Owner Vehicle. This GMC Terrain boasts a Gas/Ethanol I4 2.4L/145 engine powering this Automatic transmission. TRANSMISSION, 6-SPEED AUTOMATIC (STD), SLE-1 PREFERRED EQUIPMENT GROUP Includes Standard Equipment, SEATS, FRONT BUCKET (STD). *This GMC Terrain Features the Following Options *QUICKSILVER METALLIC, LICENSE PLATE BRACKET, FRONT, JET BLACK, PREMIUM CLOTH SEAT TRIM, ENGINE, 2.4L DOHC 4-CYLINDER SIDI (SPARK IGNITION DIRECT INJECTION) with VVT (Variable Valve Timing) (182 hp [135.7 kW] @ 6700 rpm, 172 lb-ft [232.2 N-m] @ 4900 rpm) (STD), E85 FLEXFUEL CAPABLE, FOR 2.4L DOHC 4-CYLINDER ENGINE, AXLE, 3.23 FINAL DRIVE RATIO, AUDIO SYSTEM, COLOR TOUCH AM/FM/SIRIUSXM STEREO WITH MP3 PLAYBACK includes 7 diagonal color touch-screen display, USB port, AUX port and iPod support (STD) (Includes Bluetooth for phone only. ), Wipers, front intermittent with washers, Wiper, rear intermittent with washer, Windows, power with driver and front passenger Express-Down. *Know You're Making a Reliable Purchase *According to Carfax's history report: Carfax One-Owner Vehicle. Haggerty Pontiac GMC graded the Overall Condition of this vehicle as Excellent. This vehicle has never been smoked in! *The Votes are Counted *JD Power Initial Quality Study, KBB.com Brand Image Awards. *The Experts' Verdict...*As reported by Edmunds: Spacious backseat that slides and reclines for added comfort; optional V6 engine makes this crossover faster than most competitors; interior stays quiet at highway speeds; supple suspension soaks up impacts on rough roads. *Stop By Today *Test drive this must-see, must-drive, must-own beauty today at Haggerty Pontiac GMC, 300 W. Roosevelt Rd., Villa Park, IL 60181.JUST ANNOUNCED!!! !Free Oil Change and Tire Rotation for 24 Months or 24,000 miles with the GM Certified Warranty! 12 MONTH/12000-Miles Bumper-To-Bumper Warranty! 5YRS 100000 Miles Powertrain Warranty,172-Point Inspection with Two Year Maintenance Plan Roadside Assistance and Courtesy Transportation! (The 12 month/12,000 miles warranty will go into effect after the new vehicle warranty has expired.) Let's Do the Math. New Warranty: 36-months/36,000-miles Certified Warranty: 12-months/12,000-mles Total Warranty: 48-months/48,000-miles THAT MEANS SIMPLY THAT GM CERTIFIED USED HAVE 1 YEAR LONGER THAN NEW!JUST ANNOUNCED!!! !Free Oil Change and Tire Rotation for 24 Months or 24,000 miles with the GM Certified Warranty! 12 MONTH/12000-Miles Bumper-To-Bumper Warranty! 5YRS 100000 Miles Powertrain Warranty,172-Point Inspection with Two Year Maintenance Plan Roadside Assistance and Courtesy Transportation! (The 12 month/12,000 miles warranty will go into effect after the new vehicle warranty has expired.) Let's Do the Math. New Warranty: 36-months/36,000-miles Certified Warranty: 12-months/12,000-mles Total Warranty: 48-months/48,000-miles THAT MEANS SIMPLY THAT GM CERTIFIED USED HAVE 1 YEAR LONGER THAN NEW!The Terrain is the Crossover that stands apart in a crowded small SUV Market. When most Crossovers look like cars on big wheels, the Terrain's features embrace its truck roots. Terrain is a True Crossover inside and out. It has the capability and cargo space you'd expect from an SUV but the Comfort, Technology, Quietness, and Superior Fit and Finish you might expect in a Luxury Sedan. Terrain is available as a FWD or AWD to maximize drviver control by providing extra Traction and adjusting Torque. Best-In-Class Standard Highway Fuel Economy gives you 182 HP and up to 32 MPG on the Highway. If you prefer Performance the 3.6L V6 provides 292 HP and Trailering capacity up to 3500 lbs. Come and take a test drive in a Terrain that will give you Fuel Economy, Responsive Handling, and a smooth ride with all the Luxury and Technology you might come to expect.